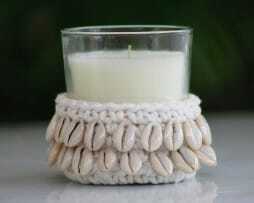 Hand crocheted candle holders beautifully decorated with white, blue or cowie shell trimmings with vanilla creme scented wax candle. 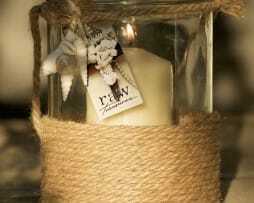 Wrapped with a hemp rope, the glow of a candle looks stunning, while featuring our signature cluster of shells tied in a rustic knot onto the handle. 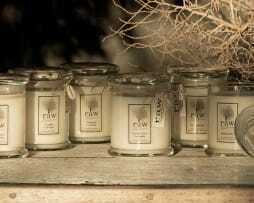 Our stunning collection of luxury Candles have been locally hand poured and blended using soy wax and then infused with exquisite Fragrances. Available in a range of sophisticated scents, our exclusive collection has got a reputation you want to experience. 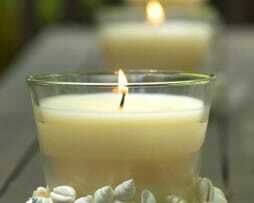 Fill your home with the pleasant vanilla aroma of our natural ‘sea breeze’ candle. 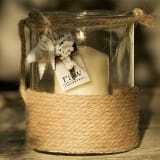 Hand decorated, this scented glass jar candle is decorated with a rim of white ocean shells and its simple and stunning. 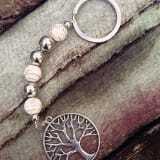 atmosphere of pure relaxing pleasure. This truly is a beautiful product. 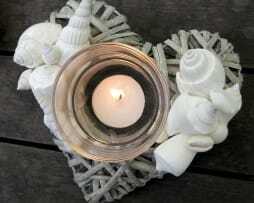 Our white-washed wicker heart tea-light candle holder is hand decorated with our signature white ocean shells. When lit, the shadows of the light bounce around the shells making perfect mood lighting. 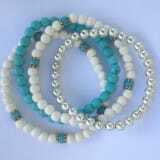 – Ideal for wedding tables, coffee tables, or side tables.